The SpaceDataHighway sounds intriguing, and it is, as it is the world’s first ‘optical fiber’ network in the sky based on cutting-edge laser technology that involves a unique system of geostationary satellites permanently fixed over a network of ground stations, with the first – EDRS-A – already in space. Together in an agreement between Airbus and Japanese telecommunications satellite operator SKY Perfect JSAT the two will be working on design preparation of the EDRS-D node. Each day, it can relay up to 40 terabytes of data acquired by observation satellites, UAVs and manned aircraft, at a rate of 1.8 Gbit/s. This third communication node of the SpaceDataHighway system is to be positioned over the Asia-Pacific region before 2025. EDRS-D will lead to a significant increase in the system’s communication capacity and considerably expand its coverage. This agreement concerns the co-financing of design and development studies for the satellite payload, as well as of the system as a whole, in addition to the marketing of the SpaceDataHighway service by SKY Perfect JSAT in Japan. With this agreement, the total amount of the investment in the extension of the SpaceDataHighway stands at nearly € 15 million. The future EDRS-D payload will consist of three next-generation laser communication terminals (LCT) to allow simultaneous communication with several satellites, as well as aircraft and UAVs. These laser terminals will have broader bandwidth, bi-directional and interoperable communication capability with Japanese laser terminals. This enables a greater range for geo-geo crosslinks with another geostationary SpaceDataHighway satellites at a distance of up to 75,000 km., and will offer near real-time relaying of data from the other side of the world. The relay satellites are designed to lock on to low-orbiting Earth observation satellites via laser and collect their data as they travel thousands of kilometers below, scanning land and oceans. The SpaceDataHighway system then immediately sends the collected data down to Earth from its higher position hovering in geostationary orbit, acting as a data relay node. This process allows the observation satellites to continuously downlink the information they are gathering, instead of having to store it until they travel over their own ground station. That way, they can send down more data, more quickly. 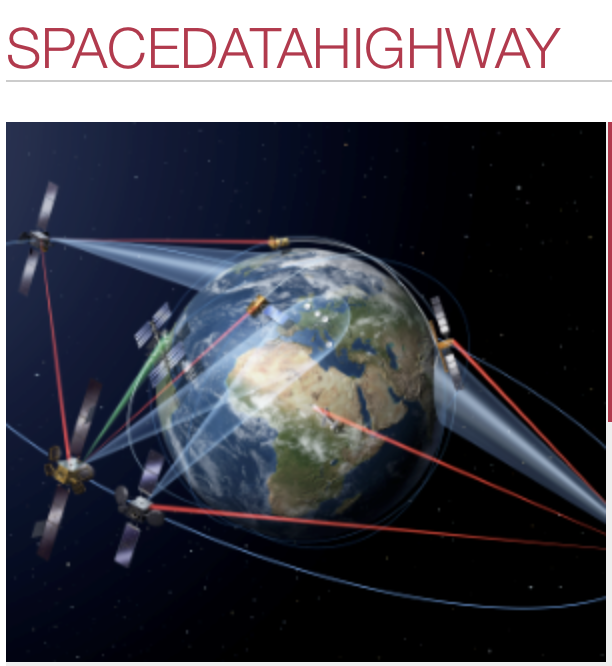 Since the end of 2016, the SpaceDataHighway system has, on a daily basis, been transmitting the images of Earth acquired by the Copernicus program’s four Sentinel observation satellites. It has increased the amount of data the satellites relay down to Europe by around 50 percent for Sentinel-1, and reducing the revisit time to map the whole world from 10 days to 5 days for Sentinel-2. The SpaceDataHighway is a public–private partnership between the European Space Agency (ESA) and Airbus, with the laser terminals developed by Tesat-Spacecom and the DLR German Space Administration. EDRS-A, the first SpaceDataHighway relay satellite launched in January 2016, offers coverage from the American East Coast to India. A second satellite will be launched in mid-2019. It will double the system’s capacity and extend the coverage and redundancy of the system.